Робот серии ST5 предназначен для быстрого и точного удаления продуктов от инжекционной машины для литья, и размещения их в нужные места. Стандартная и телескопическая рука робота выбираются для работы совместно с двумя, тремя формовочными пластинами или системой горячих литниковых каналов. Обладает способностью сборки, укладки, проверки качества и размещения форм. Подходит для машины для литья под давлением с прижимной силой до 3600 т. Designed with elegant appearance; Aluminium profiles are largely used to provide compact and streamlined appearance. ALL linear movements are driven by heavy duty servo motors with cooperation of precise linear guide rails and high power V belts; Fast, silent, and precise. Wrist mechanism employs pneumatic driven rack and pinion system, which accomplishes smooth, stable and precise flipping motion. Vertical arms with telescopic design efficiently minimizes the cycle time and height of the robot. Position limit sensors and blocks effectively prevent mechanical and electrical malfunctions. Control board is designed to CE EMC test with short circuit and noise proof functions. Control hardware fixtures are designed with flyer structure which provides benefit to maintenance. Cable drag chains help with cable management and ease for maintenance. All pneumatic accessories, electric accessories, and communication Protocols meet the global standards. Interface between injection molding machine and robot is designed to EUROMAP 12, EUROMAP 67 and SPI. Base on VARAN BUS technology with world class 8.4 inch true color touch screen and object oriented program editor, complex and continuous projection can be easily programmed within minimum time. Closed circuit control system cooperating with plug and use hardware modules provides reliable movement that is capable of arranging, stacking, quality checking, in mold inserting etc. Real time remote monitoring and telediagnosis assist better equipment management. USB port allows fast data updating, saving and loading. Plug and use industrial connectors achieve simple installation and uninstallation. 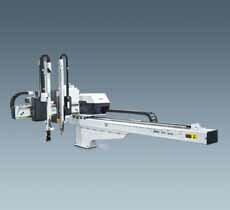 Servo driven axis provides the possibility of multi points for positioning products and sprues. Multi languages displays and spared communication connections with surrounds machines offer more flexibilities to global customers.